Lycaenidae is the second-largest family of butterflies (behind Nymphalidae, brush-footed butterflies), with over 6,000 species worldwide, whose members are also called gossamer-winged butterflies. They constitute about 30% of the known butterfly species. The family is traditionally divided into the subfamilies of the blues (Polyommatinae), the coppers (Lycaeninae), the hairstreaks (Theclinae) and the harvesters (Miletinae). Adults are small, under 5 cm usually, and brightly coloured, sometimes with a metallic gloss. Larvae are often flattened rather than cylindrical, with glands that may produce secretions that attract and subdue ants. Their cuticles tend to be thickened. Some larvae are capable of producing vibrations and low sounds that are transmitted through the substrates they inhabit. They use these sounds to communicate with ants. Adult individuals often have hairy antenna-like tails complete with black and white annulated (ringed) appearance. Many species also have a spot at the base of the tail and some turn around upon landing to confuse potential predators from recognizing the true head orientation. This causes predators to approach from the true head end resulting in early visual detection. Lycaenids are diverse in their food habits and apart from phytophagy, some of them are entomophagous feeding on aphids, scale insects, and ant larvae. Some lycaenids even exploit their association with ants by inducing ants to feed them by regurgitation, a process called trophallaxis. Not all lycaenid butterflies need ants, but about 75% of species associate with ants, a relationship called myrmecophily. These associations can be mutualistic, parasitic, or predatory depending on the species. In some species, larvae are attended and protected by ants while feeding on the host plant, and the ants receive sugar-rich honeydew from them, throughout the larval life, and in some species during the pupal stage. In other species, only the first few instars are spent on the plant, and the remainder of the larval lifespan is spent as a predator within the ant nest. It becomes a parasite, feeding on ant regurgitations, or a predator on the ant larvae. The caterpillars pupate inside the ant's nest and the ants continue to look after the pupa. Just before the adult emerges the wings of the butterfly inside the pupal case detach from it, and the pupa becomes silvery. The adult butterfly emerges from the pupa after three to four weeks, still inside the ant nest. The butterfly must crawl out of the ant nest before it can expand its wings. Several evolutionary adaptations enable these associations and they include small glands on the skin of the caterpillars called "pore cupola organs". Caterpillars of many species, except those of the Riodininae, have a gland on the seventh abdominal segment that produces honeydew and is called the "dorsal nectary gland" (also called "Newcomer's gland"). An eversible organ called the "tentacular organ" is present on the eighth abdominal segment (third segment of thorax in the Riodininae) and this is cylindrical and topped with a ring of spikes and emits chemical signals which are believed to help in communicating with ants. Many taxonomists include only the Lycaeninae, Theclinae, Polyommatinae, Poritiinae, Miletinae and Curetinae under the Lycaenidae. The tribe Aphnaeini of the subfamily Theclinae which includes the genus Chrysoritis is sometimes listed as separate subfamily. A few authorities still include the family Riodinidae within the Lycaenidae. The monotypic former subfamily Styginae represented by Styx infernalis from the Peruvian Andes has been placed within the subfamily Euselasiinae of the family Riodinidae. Other classifications notably include the Riodininae (e.g., Abisara echerius). Miletinae – harvesters (mostly African, or Oriental, some Holarctic). Probably all feed on aphids or their secretions. The fossil genus Lithodryas is usually (but not unequivocally) placed here; Lithopsyche is sometimes placed here but sometimes in the Riodininae. ^ Australian Museum factsheets Accessed 4 November 2010 on the Wayback Machine. ^ Ackery, P. R., R. de Jong, and R. I. Vane-Wright. 1999. The butterflies: Hedyloidea, Hesperioidea, and Papilionoidea. Pages 264-300 in: Lepidoptera: Moths and Butterflies. 1. Evolution, Systematics, and Biogeography. Handbook of Zoology Vol. IV, Part 35. N. P. Kristensen, ed. De Gruyter, Berlin and New York. 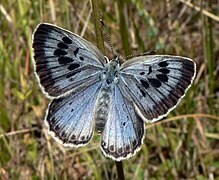 Wikimedia Commons has media related to Lycaenidae. "Lycaenidae". National Center for Biotechnology Information (NCBI).